When dealing with a sweet tooth (whether it be you or someone in your family) the answer seems to be chocolate more times than not. I may have mentioned in the past that I am not a huge fan. I find it too sweet. But what IF it there was a way to have a less sweet version? It was worth a try. 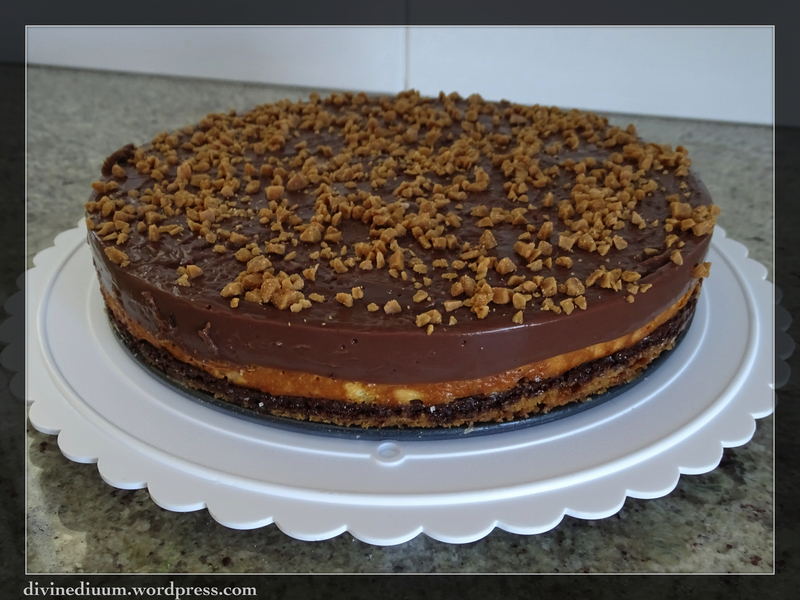 I had my first pie-making experience not too long ago and I was really curious to try a graham cracker crust. It seemed easy enough so I started by melting butter in the microwave and tossing it into crushed graham crackers. 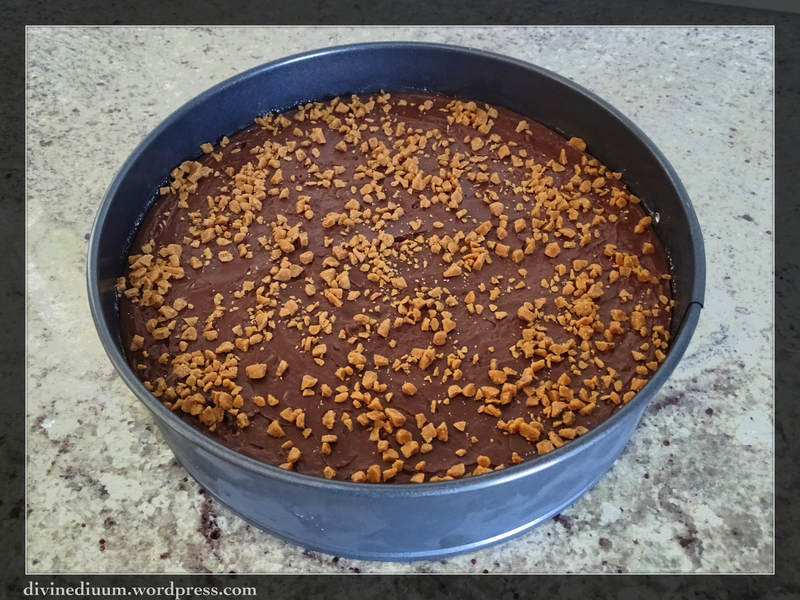 I should have stopped there, as this was going to be my first attempt at a layer cake, but I added toffee bits into the crust for good measure. Once the crust was well mixed I pressed it down into a 9″, lightly greased, springform pan. A light coconut oil spray to grease the pan was perfect. I found it helpful to put the pan in the freezer between layers. It makes the base a bit more firm when spreading the next layer. From there I moved onto the chocolate. Just to be sure that this cake would hold, I wanted to add a thin, firm layer of chocolate. To do this, I melted 6 oz of semi-sweet chocolate chips over low heat until they started to melt. Dark chocolate would be a less sweet substitute. I then added 1/2 C of coconut milk because I enjoy the creamy texture and didn’t want the chocolate to cool rock solid. It is important to stir constantly and just until the chocolate is melted. Because of the sugar content it can easily burn. The coconut milk helps with that and gives the chocolate layer a smooth texture. 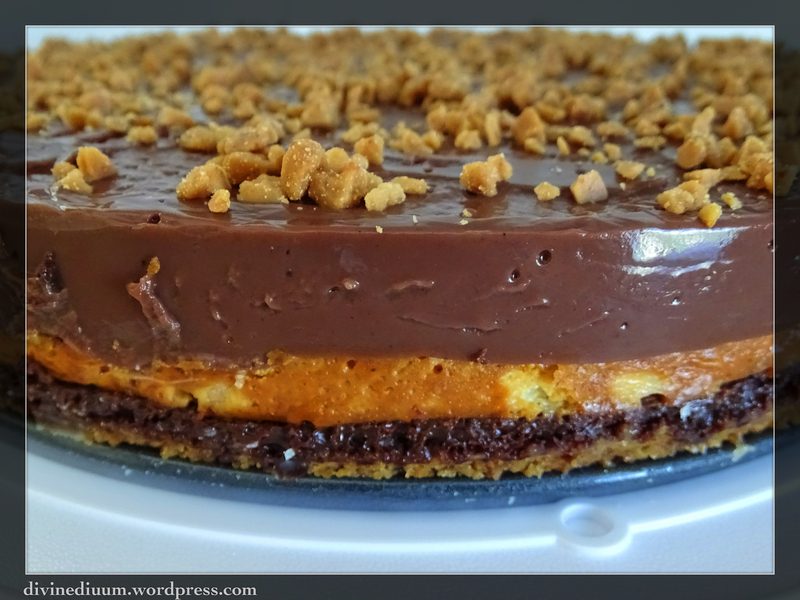 Once this layer was complete, I carefully spread it over the graham cracker layer and sprinkled it with more toffee bits. Toffee seems to be a natural companion to chocolate. This is totally optional but I figure go big or go home! Perhaps the thought of consuming a decadent chocolate cheesecake brought on some guilt so I opted for a Greek yogurt cream cheese. Did you know that even existed? I didn’t. Rather than sugar, I added yogurt as a tribute to my yogurt and honey mornings when I was in Greece. Blended with some vanilla, another 1/4 C of coconut milk and 2 eggs and the cheesecake layer was complete. This cake is sweet because of the toffee and chocolate so you may choose to skip the added honey. Just to be sure everything settled I tapped the pan on the counter and let it sit while the oven pre-heated to 325º. About 40 minutes and the cheesecake had baked through. The edges will be a beautiful golden colour which comes through on the layering. If there are cracks, not to worry! This will not be the final layer. . .but the other layer will have to wait until tomorrow. I let the cake cool and then covered it and put it in the fridge. The next day I completed the cake with a completely different texture, a chocolate pudding topping. A chocolate mousse would be just as delicious but I enjoy the creaminess of a pudding. Plus, you can buy easy-to-make options at the store no matter what you choose. I opted for a firm pudding topping that would hold its shape. I did try the instant toffee pudding topping with 1/2 the liquid that the recipe called for. It seemed pretty firm but I wasn’t going to risk my masterpiece. I followed the pudding instructions, made sure the sides of the pan were still lightly greased and then I poured the final layer. Once the pudding layer set, I topped it with more toffee bits, removed it from the springform pan and admired my creation. 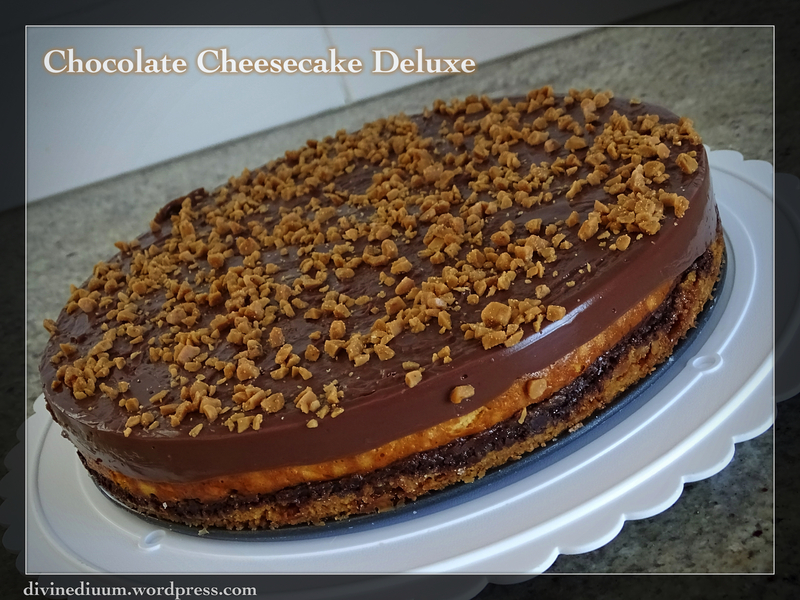 Lovely, lovely, chocolate cheesecake deluxe. 1. Mix ingredients for the crust. 2. 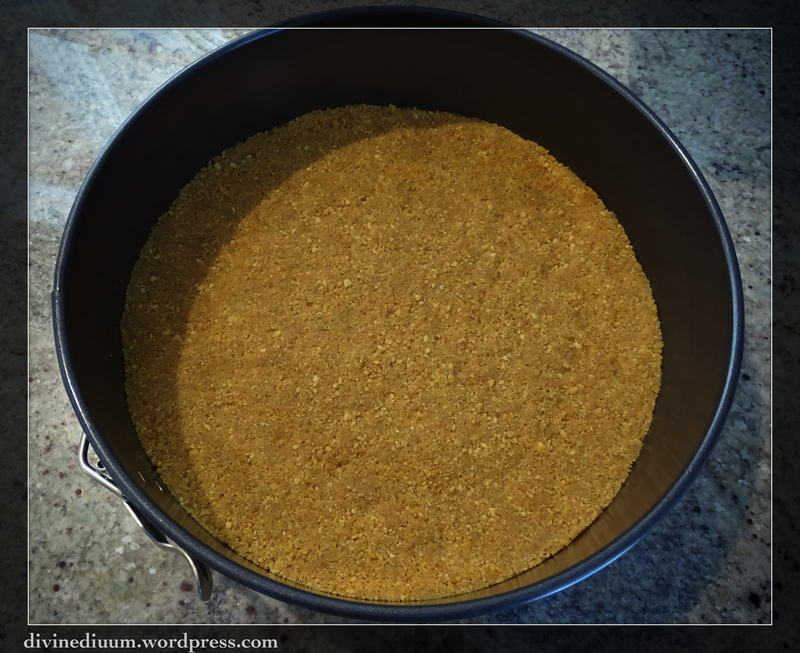 Pat mixture into a round, lightly greased, 9″ springform pan. 3. On medium heat, start to melt chocolate in a small pot. 4. When the chocolate starts to melt, add coconut milk. 5. Stir constantly until just melted. 6. 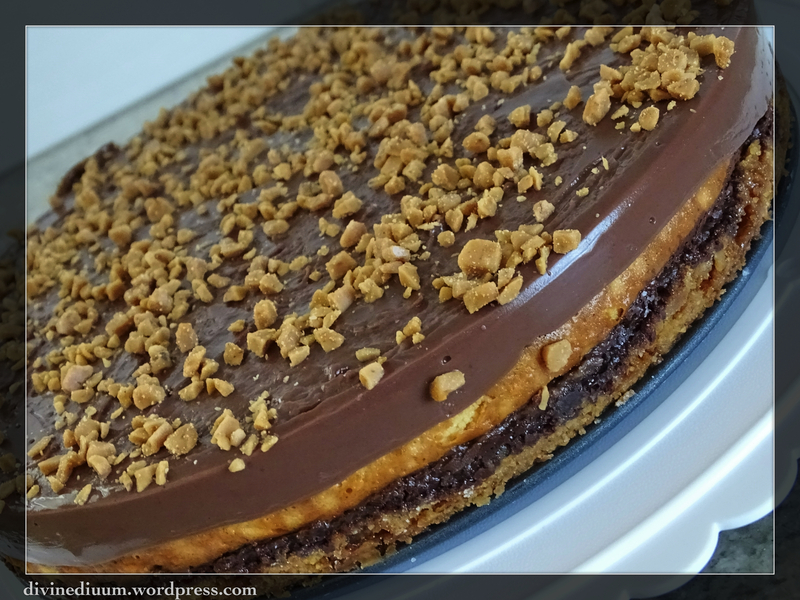 Pour the chocolate layer evenly on crust. 7. You may choose to sprinkle some toffee bits on chocolate (optional). 8. In a large bowl, use a mixer to mix the cheesecake ingredients. 9. 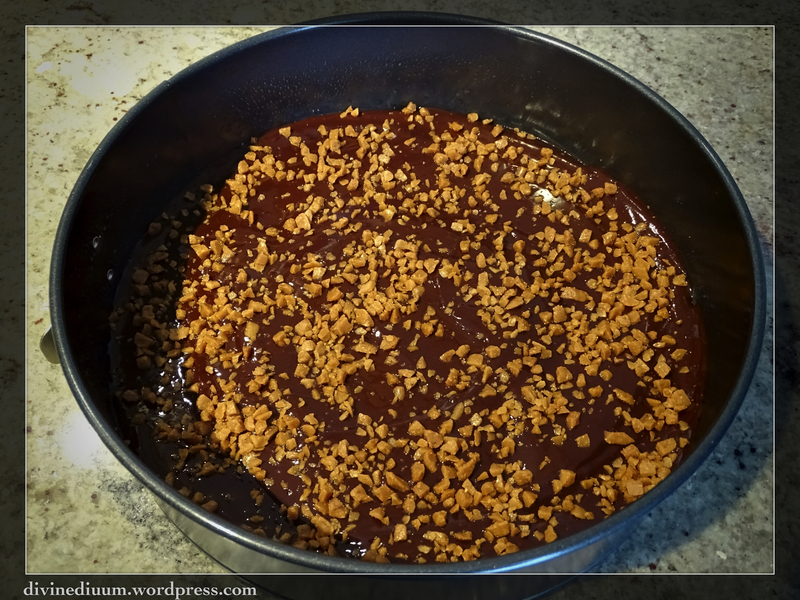 Pour cheesecake mixture on chocolate layer. 10. Bake at 325º for 40 minutes. 12. When the cake has cooled, prepare mousse or pudding topping according to recipe. 13. Pour topping on the cheesecake and let settle. 14. Remove from the pan and serve.